← Triangular Object With 3 Red Lights Hovers on Edge of Thunderstorm. Bright Orange Glowing Dot in Southern Sky. 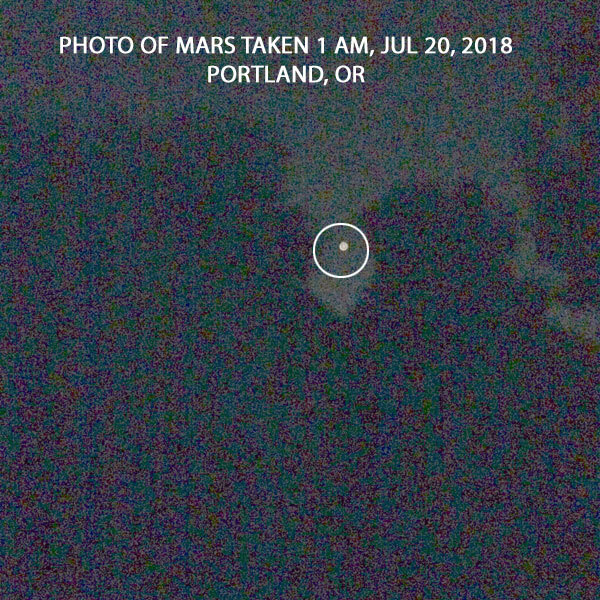 PHOTO OF MARS TAKEN JUL 20, 2018 – PORTLAND, OR. Description: I’m not sure what I saw this morning (7-18-2018, 3:30 AM). I looked out my sliding glass back bedroom door and spotted a bright orange glowing dot in the southern sky, about 30 degrees elevation and about due south between the two right hand trees. This orange dot was slightly bigger in diameter and much brighter than Venus was on Sunday just after sunset. I did not witness the object move, but after a short trip to the bathroom I looked out the glass door again to find the orange object to the left of the two trees. The photo was taken tonight just to give a view of the trees. I didn’t think to grab a photo of the orange object. I really didn’t think anything was out of the ordinary except for the color and brightness until I realized that the object (if it was a celestial object) should have moved to the right (West), not the left (East). 1. I would like to retract my UFO report dated Wednesday 7-18-2018. 3. I tried to enhance the photo a couple of times to try to show you what I had to deal with as I looked through the trees. I think the time that I reported my sighting was off. I had just woken up for a bathroom break. Still I am not sure why I opened the blackout drapes and looked out. I don’t have a clock in the bedroom and I wear glasses (which I was not wearing). This entry was posted in bright light, Orb(s) of Light, Photos, Possible Planet, UFO Sightings 2018, UFO sightings Oregon and tagged Orange colored lights. Bookmark the permalink.